Why the Double Foul-Mouthed Standards? He next time a national Irish newspaper gets up on its high horse about the behavior of Premier League soccer stars, ask them the Davy Fitzgerald question. Ask them why we have yet to read a line about the foul-mouthed verbals, caught on live TV, from the Waterford manager during the first half of the Limerick game last Sunday. Ask them why there’s one rule for Wayne Rooney and another for Davy Fitzgerald when it comes to the F word and the television cameras. And don’t buy into the argument that Rooney is paid millions every year and should know better. Both Rooney and Fitzy, whether the GAA diehards like it or not, are role models whose decisions to swear shouldn’t be allowed onto our national airwaves, no matter how much they earn or don’t as the case may be. Unless you watched Fitzgerald’s Waterford beat Limerick -- with a late John Mullane goal -- live on RTE television on Sunday afternoon, you might not have heard what Davy said. You definitely didn’t read about it in any of Monday morning’s Irish papers. They simply ignored what was clearly said after Fitzgerald took great exception to a couple of decisions by the referee Barry Kelly close to halftime in the Munster hurling semifinal in Thurles. 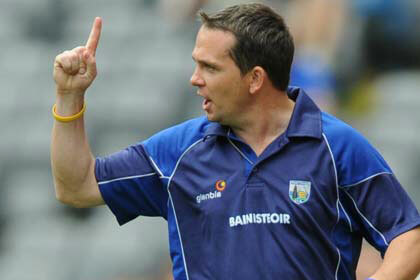 Now, to be fair to Davy Fitz, he has always been a man to wear his heart on his sleeve. He isn’t the first big name manager to get agitated by the actions of a referee and he won’t be the last. He’s also quite entitled to vent his frustrations in whatever way he sees fit -- nine times out of 10 the cameras won’t be anywhere near him when he blows his top. What’s wrong here was RTE’s decision to broadcast the feed from their sideline microphone, one of those new fangled gadgets so beloved of modern producers. It did Davy no favors at a time when his actions shouldn’t have been audible to the world. Nor did it do the GAA any good when it is fighting for the hearts of every child in the country, just like the foreign game that pays Rooney such vast sums to act as a role model for the footballers of tomorrow. What’s also wrong here is the fact that Rooney gets punished for his every misdemeanor and Fitzgerald and his GAA likes can, apparently, get away with it. Not so long ago, the media world and its mother had a go at Rooney for the profanities he shouted into a Sky camera after he had scored a crucial Premier League goal at West Ham at the start of May. The Sky producers, realising what Rooney was up to, immediately switched away from the shot and their commentator apologized for any offense caused. Fair enough. Professional sport is a serious business and Rooney’s industrial language was no different to the sort of talk that you’ll hear in most work places on a day to day basis. He didn’t get away with it, however. Some commentators in the media, these pages included, did lash the England striker for his foul-mouthed screams. So much so that the FA he represents had no choice but to ban him for two games. As a result of his swearing, Rooney missed the FA Cup semifinal defeat to Manchester City at Wembley, and who knows what might have happened in that game if Rooney had played. The England striker has also lost some high profile sponsors of late, decisions no doubt linked to some of his recent public misdemeanors. So why did the very papers who took Rooney to task not highlight the Fitzgerald comments on Monday morning? Not being a GAA writer, it’s a question I can ask.